Hey everyone, thanks for joining me for the Monday Money of the week. Just in case you’re new to the column, my name is Joshua Rodriguez and I discuss various financial topics from saving and investing to debt and much more. Today, I’m going to share a personal story with you! It’s a story that proves that with a little bit of confidence and self worth, you stand to gain a lot! I recently did a number on my back. After walking around like a crouched over old man in excruciating pain for a few days, I decided to go to a chiropractor. After being sent down the hall for X-Rays, I sat with the doc and was told that I had a herniated disc. I didn’t know much of what that meant so, I did a little research and even consulted others. Generally, to fix a herniated disc, a surgery needs to be done but, luckily for me, I’ve got an incredibly gifted MD on the case who says that he can fix it with spinal decompression therapies and other forms of treatment. All I need to do is show up 4 times a week for the next 4 weeks. Oh…yea…that’s going to cost SEVERAL THOUSAND DOLLARS AS WELL! Luckily for me, I wasn’t necessarily told I would have to pay the thousands of dollars and I’m not being held to any debt. The bottom line is, I haven’t been asked for a dime. So, How Did I Not Have To Pay A Dime? You Ask! Luckily for me, I know a thing or two about local demographic internet marketing. As a matter of fact, I’m a director of marketing for one of the leading local inbound marketing firms. The doctor I saw happened to be a client of the firm so, we had a talk. I confidently told him about my personal website, you all know it…CNA Finance. Anyway, I explained to him that I opened the site about 9 months ago and although, it’s not making much now, I showed him the trust charts and link charts I had available. We talked about all kinds of marketing strategies for his business and, he knew that I was capable of helping him not only from the work my team had done for him in the past but also from the confidence I showed while talking about what I was capable of. Now, I’m not conceited by any means. Although, I know I’m confident, I didn’t think I excited it so strongly until speaking with the doctor to be honest with you. He told me that my confidence in my strategies is what really, “blew him away!”! When a salesman gives me a call or knocks on my door, I’m often incredibly put off in most cases. But, every once in a while, there’s that one salesman that really grabs my attention in a way that simply forces me to buy. I started to think about those instances and in any case, the products were either easy to find in the store for a few bucks cheaper or very unreasonably priced but, interesting. I would not have purchased the items if it wasn’t for the incredibly confident salesman behind them. After thinking about this instance and others in my past, I’ve really learned that confidence in myself no matter what I was doing has always seemed to do well for me! This concept can really go across many realms from confidence in your ability to provide a service to confidence in investing, spending, saving, parenting and various other walks of life. The bottom line is, a confident lifestyle leads to a good life! 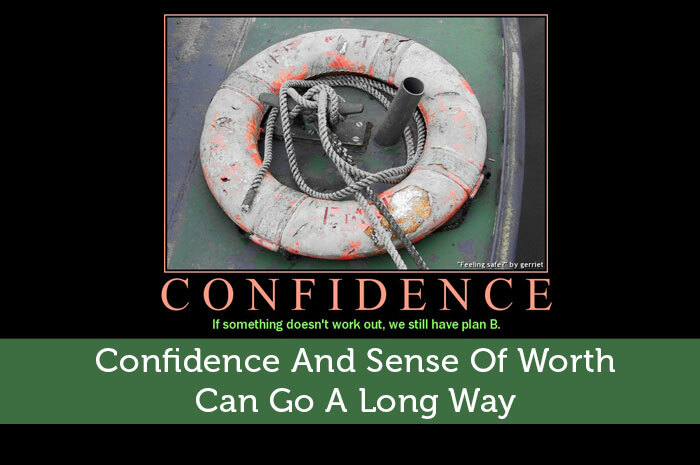 OK, so I know I just blabbered on about confidence here and we really didn’t talk much about money but, confidence can lead to a fruitful life, mentally, financially and physically! If you have any questions or concerns about this post or just want to say hi, please leave me a comment below, I promise I’ll respond! Wow, great job! I never would’ve thought about doing something like that. I have a tough time thinking about trading a service for a service. I’m still stuck in the mindset that I work for money then money buys me things. I rarely think about just trading my time for things (or a service) even though that can sometimes work better. Hey Jake, thanks for your comment. I trade service for service all the time and probably save thousands of dollars a year as a result. I’m glad I got you thinking about it! Great story! Confidence in ourselves helps keep many other negative emotions away. I started running several years ago and always had doubts in the back of my mind that I would have the discipline to be consistent with my training. After many morning running sessions and the completion of my first marathon last fall, I have really positive feelings towards myself and am confident I can continue to get even better. Hey Brian, thanks! Sounds like you’ve got a great story of your own…KEEP RUNNING! I’d love to see what you can accomplish in a few years! If there is one thing I’ve learned is that when I am passionate about something to learn about it as much as I can so I am confident about the topic or skill. I’m a confident guy but there are things I’m not confident about simply because, well, I’m not perfect. I think having confidence in yourself is a great way to keep motivated and to show others you do know what you are going on about to build that trusting relationship. Hey CBB, thanks for your comments! They’re always appreciated! I was thinking about a similar idea the other day. I thought about what I would change in my life if I had the opportunity to start all over again. I decided that I would chose to be more confident and to start pursuing my dreams earlier in life. If I’d known then what I know now, I think my confidence would triumph over all my fears. Hey Terry, thanks for your comment! I try not to think of what I could have done in the past. There’s nothing I can do about it today. So, I replace those thoughts with what I can do today to become more financially stable, confident and more! Thanks again for your comment! Such a good point. Too many people forget that barter can solve problems as easily cash can (or even more easily in some cases). Joshua, first off, good job on the trading of services! Second, SO glad you chose the non-surgery route. From everything I’ve read and heard from my chiro, the route you’re taking is definitely the best way to go. Happy healing!